HMS has released TimeControl 6.2 for both new and existing clients. 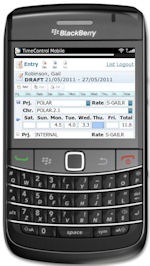 This version continues the 6th evolution of one of the world’s most popular timesheet systems. Since its initial release in 1984, TimeControl has been one of the most recognized timesheet systems for organizations who need a single timesheet interface to fulfill the multiple requirements of payroll, human resources, project management and finance. TimeControl Mobile is designed to work on popular smartphones like the Blackberry and iPhone. This is a web application that works with TimeControl as an extension of your existing implementation. As a mobile web-application there’s nothing to install. The user simply points their smartphone browser to the new /mobile directory of their TimeControl implementation and they are directed to an interface specifically created for the mobile device. TimeControl Mobile includes functionality for adding, editing and deleting a timesheet, adding, editing and deleting timesheet lines. Even changing values for user defined fields is supported. Just like the full web-based TimeControl, users who have pre-loading turned on or have defined personal pre-loaded charges will see them appear automatically in TimeControl Mobile when they create a new timesheet. This makes adding data very easy in the mobile device.If your TimeControl implementation is tied to a project management system like Microsoft Project or Primavera, your assignments could automatically appear when you create a new timesheet so you can update your activity hours in the field. TimeControl Mobile works in both Portrait and Landscape mode. When the user flips their device from one orientation to the other, TimeControl immediately resizes the screen to take advantage of whatever space is available. We’ve tried TimeControl Mobile on iPhones, Blackberry’s, Android and Windows 7 Mobile devices. Whatever your smartphone, there’s a good chance that TimeControl Mobile will work on it. TimeControl now allows an option where the report headers will show the details of the filter you’ve selected. This means that selecting a date range or a particular range of data will be apparent from the values in the filter thus making it easier to ensure you’re looking at the right report data. We’ve made some huge improvements in table performance some of which have improved some table functions by as much as 500%! TimeControl has allowed the client to insert their own image into the TimeControl login screen for some time. Now we’ve enhanced the ability for customized branding by providing a new image in the header of each TimeControl page. We’ve improved our TimeControl to Project Server link to take advantage of some of Project Server 2010’s capabilities. Now enterprise fields can be put into the charge code definition when linking and TimeControl will support the transfer of Sub-projects. And lots, lots more… There are improvements and other minor enhancements across the system including in logs, reporting fonts, the timesheet list, the timesheet interface and drop down field descriptions. TimeControl 6.2 is available immediately. TimeControl customers with existing current support contracts can download the new version from the Support/Updates area of the TimeControl website.